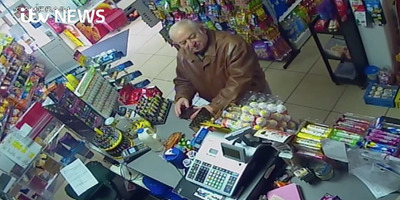 ITV NewsSergei Skripal buying groceries near his Salisbury home five days before he collapsed. British government scientists have reportedly concluded “beyond reasonable doubt” that the nerve agent used to poison ex-Russian spy Sergei Skripal and his daughter Yulia last week was made in Russia. Specialists at Porton Down, the Ministry of Defence’s chemical warfare lab, reached the conclusion last night, according to The Daily Telegraph newspaper. Tests carried out on Sunday proved “beyond reasonable doubt” that Russia made the chemical used in the attempted murder on March 4. The compound’s identity has yet to be made public. Senior government sources also told The Times newspaper that police and security officials have established “sufficient evidence” to link Russia to the attack. The announcement is expected to come after a National Security Council meeting on Monday, where May will take evidence from the UK’s three intelligence agencies MI5, MI6, and GCHQ. Tom Tugendhat, the chairman of the House of Commons Foreign Affairs Committee, also told BBC Radio 4’s “Today” programme that the attack looks like it was state-sponsored. A police officer, Sergeant Nick Bailey, was also seriously injured after responding to the Skripals. He is now “talking and engaging,” UK Home Secretary Amber Rudd said.